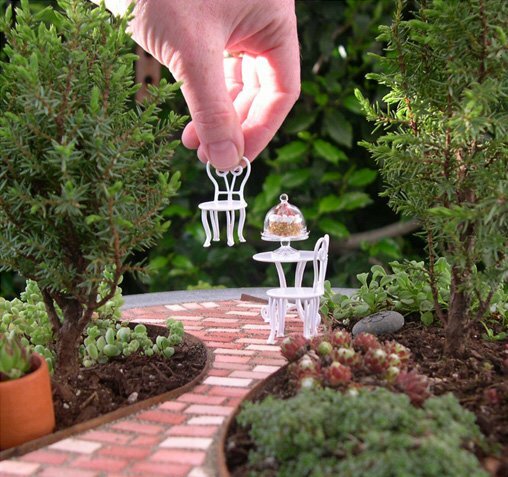 “Big things come in small packages.” It is so true … especially when it comes to miniature gardening. It’s just like life-size gardening, but on a tinier scale. It is similar to making miniature dollhouses, but using plants and making indoor gardens. Miniature gardens are made of slow-growing plants, typically ones that are “dwarf” and “miniature.” These two terms describe the growth rate of the plant, not the mature size. “Dwarf” means the plant grows 1″ to 6″ per year. “Miniature” means the plant will grow less than 1″ per year. The plants are combined with miniature accessories and in-scale patios to make real, living mini garden scenes, that can last up to eight years in a container with minimal care. When planted correctly, the plants and trees stay in scale with each other to create a sustainable, true garden in miniature. 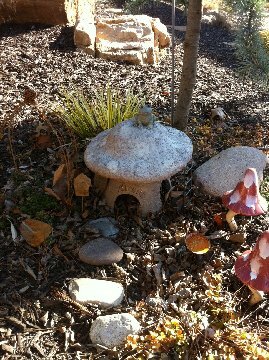 I have started an outdoor miniature “faerie” garden for my granddaughter, Anna. Here you will see a photo of our work in progress. Naturally, now, it is in a dormant state, but it makes me smile every time I look out my kitchen and dining room windows because it brings back so many memories of Anna and I playing there this summer. It is a work in progress, as we just started our “garden” this summer. So now, consider starting our own miniature garden “container”style to help you through the winter months. I hope you enjoy the pictures I’ve included as inspiration. Then visit us, and we can help get you started. Consider a dinosaur garden for the young male explorer in your life, or even a Barbie doll size would be wonderful for the princess in your life. Let your imagination run wild. I know I have plenty of ideas for miniature gardens as Abbey and I spent countless hours playing with miniatures when she was young and I can’t wait to continue it with Anna! That is awesome! Are you going to offer some sort of class? I have a small group of people who would also be interested in a class or demonstration. (6 to 8 people) Perhaps a hands-on, “make & take”. Thank you for your interest. We are lining up winter/spring classes now. Mini gardening is not included yet, but will be doing a class on this soon. 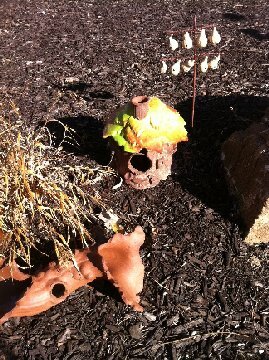 We have examples planted and set up at the store now to view. We can also help you with questions, plant suggestions and care information if you stop by. Once all is set, the events will be listed on the Events page of our website at http://www.hillermann.com. Also, groups can call us at 636-239-6729 to set up a special visit or class at our garden center.